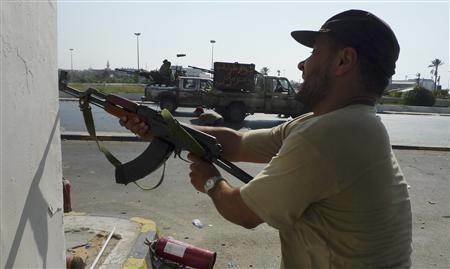 All hell breaks loose when Gaddafi forces open fire, apparently with anti-aircraft guns, on a compound in Tripoli where rebel commanders are discussing how to secure the city. The rebels scatter, some taking cover and others shooting back, and their mood turns in an instant from confidence to apprehension. Minutes earlier, the rebels had been waving flags in front of the main gate of the compound, a female police academy they had just captured. “Libya is free, Libya is free,” several fighters in camouflage uniforms shouted. Others fired guns into the air, dancing in front of the academy. Dozens of rebels looted the two main academy buildings not far from the central Babiziya gate, tearing down posters of Libyan leader Muammar Gaddafi. “Gaddafi is finished. He’s gone,” said a rebel carrying an automatic rifle over his shoulder. One of his comrades used the still-working phone in an abandoned office. On one desk lay orders signed by a Libyan official to supply officers with petrol rations, dated Saturday. Other papers approving holiday plans for academy students were issued on the same day. Inside the compound — where government forces had left the air-conditioning running in some rooms — rebel commanders gathered to discuss the next steps. “We just arrived and our priority is to secure the city,” said Hisham Bourajad, one of the commanders of the Tripoli Revolutionary Guard, one of the best-organised of the often ill-trained opposition forces. Five rebels dozed on the lane in the inner courtyard. That’s when the attack began. A bullet killed a fighter inside, while a passenger in another car trying to seek shelter inside the gate died an instant later, rebels said. A rocket hit a car parked at the front of the compound and smoke billowed from the wreckage. Rebels frantically sought shelter inside the academy. Many rebels — some of them just teenagers — dived to the ground, while some opened fire with handguns. Many didn’t bother to take close aim. Commanders called out orders to aim anti-aircraft guns at the suspected source of hostile fire.